Iron Rival Series filters are offered with 3 media options: Birm® (Good), Katalox Light® (Better), and Filox (Best). See our Compare Models tab to determine the best choice for your application. Our Katalox Light® media option is powerful, yet affordable option for the removal of up to 7 mg/l (ppm) of iron as well as concurrent removal of hydrogen sulfide (H2S) which causes a distinct rotten egg odor. Katalox Light® will also remove low levels of manganese under the right operating conditions. This media option is well suited to low yield wells due to its light weight which allows for lower backwash flow rates and frequency. 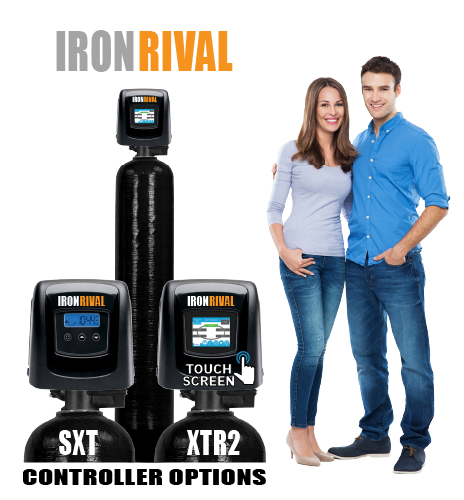 All Iron Rival systems are designed to backwash periodically to eject trapped sediment and particulates. Accordingly, the control valve is connected to a drain and the backwash water together with the rejected contaminants are simply discharged to the drain during the backwash process. The backwash is controlled by the robust and time-proven Fleck 2510AIO SXT digital control valve, and is generally programmed to occur in the middle of the night (fully adjustable) when you are not likely to be using any water. In a typical residential application, the Katalox Light® media will be backwashed every 3 days. 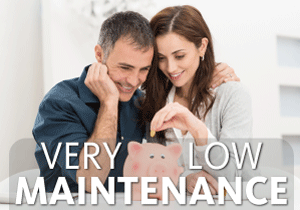 It should be replaced approximately every 5-10 years to maintain optimal performance. The water then reaches the treatment tank's bed of Katalox Light® catalyst media. Katalox Light® rapidly accelerates the combination of the dissolved contaminants and the oxygen, resulting in the formation of oxidized particles (primarily iron hydroxide, insoluble forms of manganese, and sulfur precipitates). These particles quickly grow in size and become trapped within the media bed. By the time the water reaches the bottom of the treatment tank, it is virtually free of any iron, manganese, or hydrogen sulfide. A support bed of gravel ensures even water flow through the media bed. Periodically, the digital control valve will automatically backwash and regenerate the system without any intervention required. This process is pre-programmed at our factory to occur at specific intervals based on your water conditions and media selected - it is normally set to occur every 3 days for Katalox Light®. The regeneration is typically scheduled to occur at night when water is unlikely to be in use for maximum convenience. No chemicals or salt are required. During regeneration, the remaining captive air charge is purged, the catalyst media is backwashed to send the oxidized particles down the drain, and the chamber of air is replenished. The Katalox Light® media has a long service life, generally 5-10 years. It can be replaced in about half an hour without any plumbing knowledge or special experience - anyone can do it. 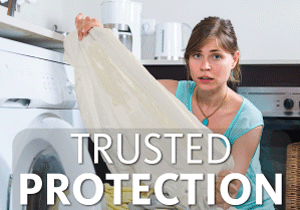 There is no need to replace filter cartridges every few months, saving you time and money. Watch Water's Katalox Light® is a remarkable new iron removal media from Germany. It combines some of the performance characteristics of Filox media with the light weight properties of Birm®, resulting in a economical treatment option for high levels of iron as well as some manganese and hydrogen sulfide. A key advantage of Katalox Light® is that it is easy to backwash due to its light weight. This results in substantial water savings making Katalox Light® an ideal option for wells with low water yield. Like most iron removal medias, Katalox Light® acts as an insoluble catalyst to enhance the reaction between dissolved oxygen and the iron compounds to form ferric hydroxide which is then removed through mechanical filtration in the media bed. As a catalyst, Katalox Light® is not consumed in the iron removal process and it does not need to be regenerated. Also like most other iron removal media, the active ingredient in Katalox Light® is manganese dioxide. Kaltalox Light® is composed of a manganese dioxide coated zeolite, containing about 10% manganese dioxide, far higher than Birm® but less than Filox. While popular due to its economical price and light weight, katalox Light® is not ideal for all iron treatment applications. It has specific operating conditions that must be met for successful treatment. While in the right conditions, it can be successfully used to remove manganese as well as iron, it is our opinion that the Filox media options is generally a better option for the removal of manganese in most conditions. If Katalox Light® is used for manganese reduction, the pH of the raw water should be between 8.0 and 8.5 if you are also attempting to treat iron, or 8.0 and 9.0 if treating only manganese. pH greater than 8.5 could cause formation of colloidal iron which is very hard to filter. 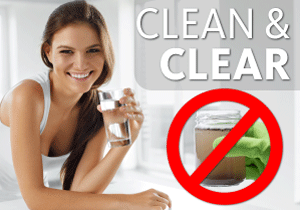 Since Katalox Light® contains a small amount of hydrated lime, an increase in the pH of the treated water can occur. This is usually minor and generally goes away with time.